Our newest addition A Bundle of Joy by Red Rooster is such a sweet fabric to add to any baby quilt, nursery ensemble or clothing. 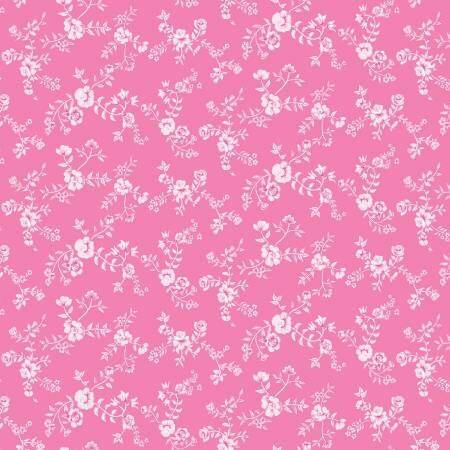 This sweet fabric includes a soft pink background with white mini floral. Add this sweet fabric to the multi tossed clothing print or even the fun border print fabric from this collection. A hit with any new mom! Don't forget to download your free quilt pattern from Red Rooster. Copy and paste the link listed below! All fabric from The Quilted Nursery Children's Fabric Store is cut directly from the bolt in continuous yardage unless otherwise specified. For your shopping convenience we now offer fractional yardage amounts. We do offer combined shipping and refund any overage in shipping when fabric ships. Same day shipping always! So cute with the bunny ballet fabric!! Made this amazing self-binding quilt from a tutorial on YouTub. A friend's daughter is due in December with a girl. Here's a pic of the quilt I made.